Building local FLOSS communities isn't that easy! It requires first communicating in a very clear and sincere way our motivations, the nature of possible contributions, their global impacts, and the technical and social benefits we potentially get back. Then, we need systematic and effective means to generate culture, support newcomers, identify their strengths, and help them to overcome the many barriers they usually face. Ultimately, we must keep such a social-technical organism alive, establishing mid- and long-term goals, learning from the ups and downs, and handling the challenges of building thriving communities in places with continental dimension such as Brazil and Latin America. The KDE Latin America Summit – LaKademy – has found its way towards establishing a regular and consolidated venue for discussing actions, making contributions of many facets, and supporting newcomers for KDE in Brazil and Latin America. The 3rd edition of LaKademy took place from 3rd to 6th June, 2015, at the Information Technology Offices of Federal University of Bahia, in Salvador, Bahia, Brazil. For the first time, we ran a fund-raising campaign in the weeks leading up to the meeting, which covered part of the expenses for having LaKademy 2015. Once again, we would like to thank those who contributed to the campaign, we greatly appreciate your support! Fifteen participants, from veterans to newcomers, met in those four days of sprints. 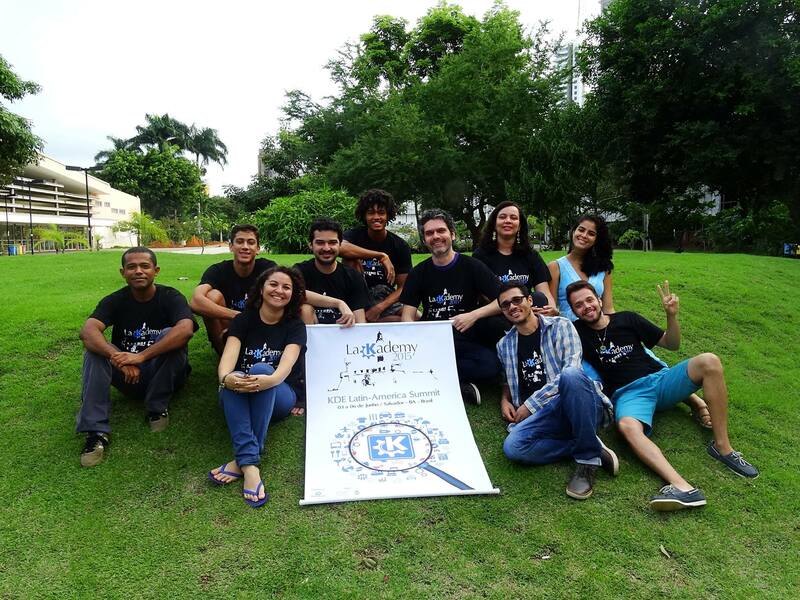 Unfortunately, our fellows from Argentina and Peru were not able to attend LaKademy 2015, making this resembling more like an Akademy-BR, reinforced by the fact that it happened in Salvador – the place where this series of KDE meetings began five years ago. As well as those who have been contributing to KDE before, nine newcomers joined us in development, translation, and promotion activities. Daniela, Alana, and Filipe worked at removing KDELibs4Support dependency from Cantor. Aracele did some porting of translation tutorials to the new KDE Brazil website and updated some old KDE3 stuff. Lamarque worked on the triage of PlasmaNetworkManager bugs and Ícaro, Rodrigo, and Fernando made their first steps towards KDE contribution by implementing a feature for increasing the ball size as game runs in Kollision. Simone, who is doing her PhD on software ecosystems, participated doing interviews and surveys about several technical and social aspects of being a KDE contributor. Rafael, our sys-admin master, presented a short-talk about the KDE infrastructure and areas of contribution. As usual, the promo meeting raised plenty of work to be done. We also better organized such tasks in the KDE Brazil kanboard, reviewed our finances, and decided about some actions for FISL, Latinoware, and the continuous presence of KDE in Brazil and Latin America. 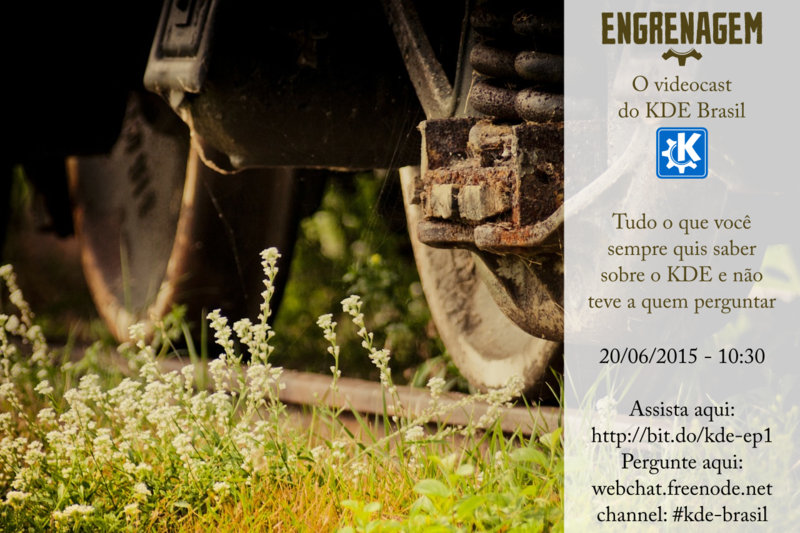 One of the outcomes of the promo meeting is Engrenagem (gear, in Portuguese) – a video series about KDE that is going to run on a regular basis, initially aimed at the Brazilian community. The first episode – named Everything you'd like to know about KDE (not meant to be overly pretentious, but to feature a quite general first episode) – has already been recorded on the 20th of June and the second one, devoted to “The role of Qt in the KDE Community”, is scheduled for 18th July. It's notorious how the roles, relationships, and dependencies among Linux, Qt, and KDE are still obscure for a general audience and for some young CS students and practitioners. We hope Engrenagem will contribute to shed some light on such misunderstandings and make the motivations and roadmap to KDE contribution more widely communicated. We would like to thank KDE e.V. and LaKademy 2015's donators for the financial support and Programa Onda Digital and UFBA's Superintendência de Tecnologia da Informação for the valuable help in organizing and hosting LaKademy 2015.